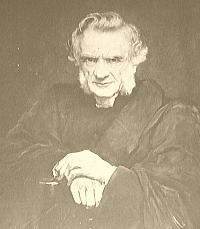 Brooke Foss Westcott (1825-1901) and Fenton John Anthony Hort (1828-1892) have been highly controversial figures in biblical history. We cannot blindly accept the finding of any scholar without investigating what his beliefs are concerning the Bible and its doctrines. Scholarship alone makes for an inadequate and dangerous authority, therefore we are forced to scrutinize these men's lives. In spite of the FACT that the readings of the Universal Text were found to be as old, or older, Westcott and Hort still sought to dislodge it from its place of high standing in biblical history. That these men should lend their influence to a family of MSS which have a history of attacking and diluting the major doctrines of the Bible, should not come as a surprise. Oddly enough, neither man believed that the Bible should be treated any differently than the writings of the lost historians and philosophers! Thus we see that Dr. Hort's opinions were certainly not inhibited by orthodoxy. Yet his wayward ways do not end here. For, as his own writings display, Dr. Hort fell short in several other fundamental areas. There was also his rejection of Christ's atoning death for the sins of all mankind. In fact, Hort considered the teachings of Christ's atonement as heresy! The fact is, that Hort believed Satan more worthy of accepting Christ's payment for sins than God. Dr. Hort also believed that the Roman Catholic teaching of “baptismal regeneration” was more correct than the “evangelical” teaching. If fundamental pastors of today enlisted the services of an evangelist and found that this evangelist had beliefs paralleling those of Fenton John Anthony Hort, I believe that the pastor would cancel the meeting. Strangely through, when a pastor discovers such to be true about Dr. Hort, he excuses him as “a great Greek scholar” and presents his Authorized Version to him to be maliciously dissected and then discarded as Dr. Hort sets himself down in the seat of authority which the Bible once held. Here again I must assert that most often this is done with childlike faith on the part of the pastor, due to the education he received while in seminary. The seminary is not really guilty either, for they have simply and unsuspectingly accepted the authority of two men raised under the influence of a campaign by the Jesuits to re-Romanize England. He also said “David” is not a chronological but a spiritual person. That the first three chapter of Genesis are all allegory has been believed by liberals and modernists for years. Do today's fundamentalists realize that those modernists' beliefs were nurtures in the heart of this Bible critic? Westcott was also a doubter of the Biblical account of miracles: “I never read an account of a miracle but I seem instinctively to feel its improbability, and discover somewhat of evidence in the account of it.” If a great fundamental preacher of our day were to make this statement, he would be called apostate, but what then of Westcott? Westcott and Hort were two non-Christian Anglican ministers. Fully steeped in the Alexandrian philosophy that “there is no perfect Bible,” they had a vicious distaste for the King James Bible and its Antiochian Greek text, the Textus Receptus. Both believed that Heaven existed only in the mind of man. Westcott accepted and promoted prayers for the dead. Both were admirers of Mary (Westcott going so far as to call his wife Sarah, “Mary”), and Hort was an admirer and proponent of Darwin and his theory of evolution. Sadly, both men died having never known the joy and peace of claiming Jesus Christ as their Savior. These are the two unsaved heretics who gave the world the New International Version (NIV) and ALL modern-day corrupt Bible versions. Even the satanic false religion of the Jehovah's Witnesses, founded in 1874 by Charles Taze Russell, derived their corrupt New World Translation (NWT) from the Greek work of heretic's Westcott and Hort. You can verify this by looking inside the front section of The Kingdom Interlinear Translations Of The Greek Scriptures which is published by the Jehovah's Witness' Watch Tower Bible And Tract Society. If you use the Holman Christian Standard (HCS) published by the apostate Southern Baptist Convention (SBC), then you are foolishly using the same corrupt Bible text as the cult of Jehovah's Witnesses! Bible Origins Chart (a chart showing where modern corrupt Bibles versions came from verses the precious King James Bible). Bless God, I'll keep using the time-tested, preacher-proven, Christ-honoring, undiluted, Textus Receptus and the precious and trustworthy King James Bible that is translated from it. Accept no substitutes!! !